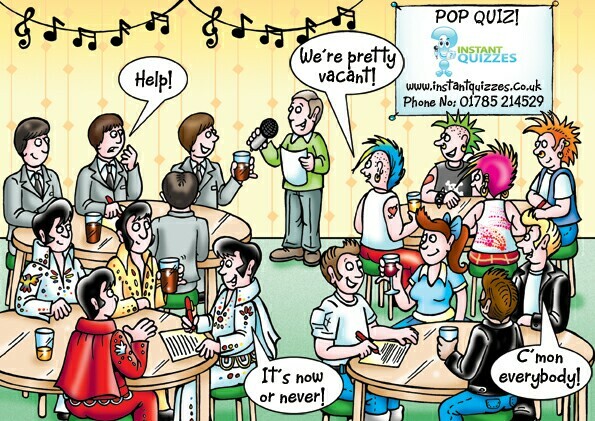 For a free sample of our pop music quiz packs download the pop music quiz pack above – just right click on the link and save to your hard drive. What was the last ever single Elvis Presley released during his lifetime – his first number one following his death? A hit for Boyzone in 1998, which Andrew Lloyd Webber musical featured the track No Matter What? Adam Levine is the lead singer with which Californian rock band? Which 1999 chart-topper was the biggest ever selling single for Cher? Released in 2005, what was the name of Babyshambles’ debut album? Who played slide guitar on the 1971 John Lennon track How Do You Sleep – a song allegedly written about Paul McCartney? The 1997 film Space Jam featured which massive hit by R. Kelly? In the film Quadrophenia, which Kinks’ classic did Phil Daniels sing whilst lying naked in a bath? Electric Light Orchestra formed in 1970 in which city? Complete this lyric to Gwen Stefani’s 4 In The Morning: “Stay up till four in the morning and the what… are pouring“? Which song charted the highest at number two for Elvis Costello: Pump It Up, Oliver’s Army or Don’t Let Me Be Misunderstood? What was both a debut album and single for pop diva Anastacia in 2000? What did footballers still have in the lyrics to Sandi Thom’s I Wish I Was APunk Rocker (With Flowers In My Hair)? In the video to Savage Garden’s I Knew I Loved You, which SpiderMan actress played the object of Darren Hayes’ affections? Which Beatle is pictured first walking across the road on the Abbey Road album cover? In 2007, legendary rockers Status Quo released their 28th studio album called In Search Of The what Chord? What did Charlotte Church and Gavin Henson call their baby girl, born on 20 September 2007? Who are Jenny Berggren, Jonas Berggren, Linn Berggren and Ulf Ekberg? In 1987, I Still Haven’t Found What I’m Looking For was U2’s first number one hit in which country? Which American, sharing his name with a cartoon character, co-hosted the M.O.B.O. Awards with Jamelia in September 2007? In which chart hit did Akon boast about his Lamborghini Gallardo? Which song recorded with Bryan Adams became a number one hit for Chicane in 2000? Which Jamiroquai album featured the hits Virtual Insanity and Cosmic Girl? In which 2006 film was Justin Timberlake sent to prison for kidnapping? I Guess That’s Why They Call It The Blues was a Top 5 hit for Elton John in 1983. Name the album on which it appeared. Why was Lily Allen riding through London on a bike in LDN? Which chocolate brand sent Phil Collins back into the chart in 2007 with In The Air Tonight? Which ‘S.S.’ is the alter ego of rapper Eminem? Whose award acceptance speech at the 2007 MTV Europe Music Awards was “Erm Thanks”? What did Steps, Cleopatra, Tina Cousins, Billie Piper and B*Witched” Thank Abba For at the 1999 Brit Awards? Who sang lead vocals with 1970s and 1980s rock group Electric Light Orchestra? In 1989, Cher caused controversy by appearing in a skimpy, black see-through outfit for which music video? What is Fergie’s real name? Who was the youngest sibling in the Jackson 5? Who co-produced her 2006 hit Rehab with Amy Winehouse? What peak position did Enrique Iglesias reach on the U.K. chart with Do YouKnow? : 3, 13 or 30? Which former Mis-Teeq member had a solo hit with Lipstick? Who was the oldest Gibb brother in the Bee Gees? In 1995, Mariah Carey hit it off with which boy band on the U.S. chart-topper One Sweet Day? In what year were Black Sabbath inducted into the Rock and Roll Hall of Fame – 1986, 1996 or 2006? Which ‘V.F.’ was the first single released by the Spice Girls without Geri Halliwell? Nicknamed Snoopy by his mother as a child, what is Snoop Dogg’s real name: Curtis Jackson, Calvin Broadus, Jr. or Jeffrey Atkins? How were Plain White T’s going to pay the bills in their hit Hey There Delilah? What song did Geri Halliwell perform at the 2000 BRIT Awards after emerging from a pair of giant inflatable legs? In the 1960s, I Say A Little Prayer and Walk On By were hits for Dionne Warwick. Burt Bacharach composed the music but who wrote the lyrics? Which Jimi Hendrix classic contained the line “‘Scuse me while I kiss the sky”? With whom did East 17 record the 1996 duet If You Ever? In their 2006 number one hit When The Sun Goes Down, the Arctic Monkeys name checked which song by The Police? Which single from Will Young’s 2003 album Friday’s Child went straight to number one in its first week of release? With whom did Christina Aguilera record the 2001 hit track Lady Marmalade?